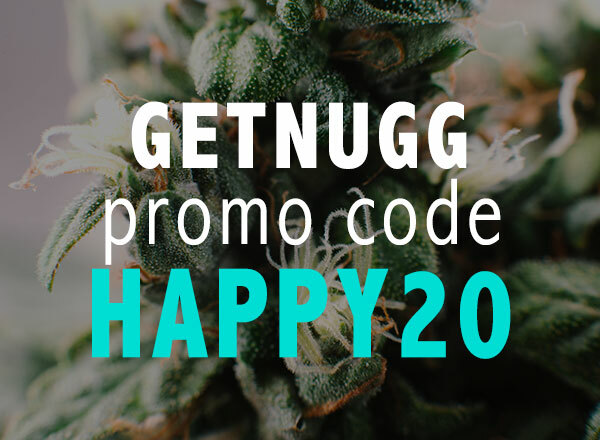 Getnugg Promo Code: Use code HAPPY20 for $20 off your First Order! Nugg is offering a $20 discount when you use the GetNugg promo code HAPPY20. Enter it during checkout, or in the “Enter Promo Code” section under the menu. Nugg offers new users a $20 discount on their first delivery. You can get it either by signing up for Nugg here, or by entering the GetNugg promo code HAPPY20 on your account. This is a pretty awesome first-timer discount as far as weed delivery places go. The only one that might be better is the one offered by Kushfly, which gives you 10% off—so it is only better if you order over $200. Otherwise, this Nugg one is as high as it gets, at least for your first order. Perhaps unsurprisingly, there are quite a number of weed delivery services out there, especially in California. So if you’re in a delivery zone for Nugg, you’re likely in a delivery zone for another service. You can read our post on all of the other options on our Weed Delivered to your House post. It includes coupons for each other places, totaling over $200 in free weed (say what?). If you’re on the Nugg website, be sure to find a dispensary that offers the “Girl Scout Cookies” flower strain. It’s definitely one not to miss. We’re also fans of the Happy Roots Lollipops, if you can find those at a dispensary near you. Speaking of which—the way Nugg works is it will only list dispensaries that are specifically able to deliver to your address. So what I see on the Nugg website isn’t exactly what you’ll see—unless we’re in the same delivery zone. But for everywhere they deliver, it seems like there a lot of options. Comment and let us know what your favorite products are in your zip code!